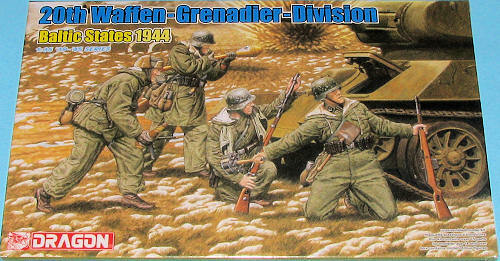 Another of Dragon's fine figure sets is this one depicting four soldiers of the 20th Waffen-Grenadier Division in the Blatic states during 1944. As is typical of Dragon's figure line, this one has a lot of optional parts. In fact, there are five smaller sprues that have nothing but weapons on them. This includes some RPGs and the decal sheet that is with this set is primarily for those weapons. The four figures are in various poses and are superbly molded as you might expect. All of the various packs, helmets and other bits are separate items. The instructions are on the back of the box as is the painting guide. This uses Gunze and Model Master references. Overall, a fine figure set that should add a lot of interest to your next diorama.